In late 2017, Down Home NC knocked on more than 4,000 doors in small town and rural North Carolina. We wanted to know what struggles and solutions mattered to rural working class families of all races. 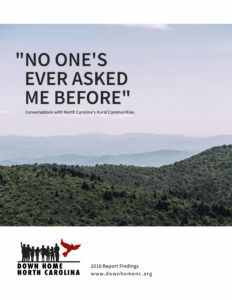 Now, in Down Home NC’s new report we share our findings from nearly 1,500 front-porch conversations in Haywood and Alamance counties. They describe a rural working class that is multi-racial, surprisingly united, and ready to speak out. Find the full report below. Join our efforts here, and consider supporting our work with a donation here.